Before we could even get a recap up from Team Camp last week, Jeanni Seymour, Tim Hola, Susanne Davis, and Ellen Hart captured their first victory of the season. Immediately after Timex Camp in Boulder, CO, Jeanni Seymour and Justin Metzler traveled to China for Liuzhou 70.3. Donning her brand new Castrelli team kit, Jeanni fought through a strong women's field, finishing her race with a race-best 1:17:15 half marathon and capturing her first win of the season. Justin finished a respectable 6th place in a fast men's field led by fellow Boulder resident, Tim Don. Oceanside 70.3, the USA's 70.3 season opener, hosted several Timex athletes looking to get an early race under their belts. At Galveston 70.3 in Texas, Kelly Fillnow (NC) came across the line 8th in the women's pro field. Laurence Delisle (CA) captured both the F25-29 win and the overall age group title in a time of 4:31:32. Laurence was 11th overall including the pros. In Hawaii, Ellen Hart (CO) secured her first win of the season in the F55-59 age group at Lavaman Tri. 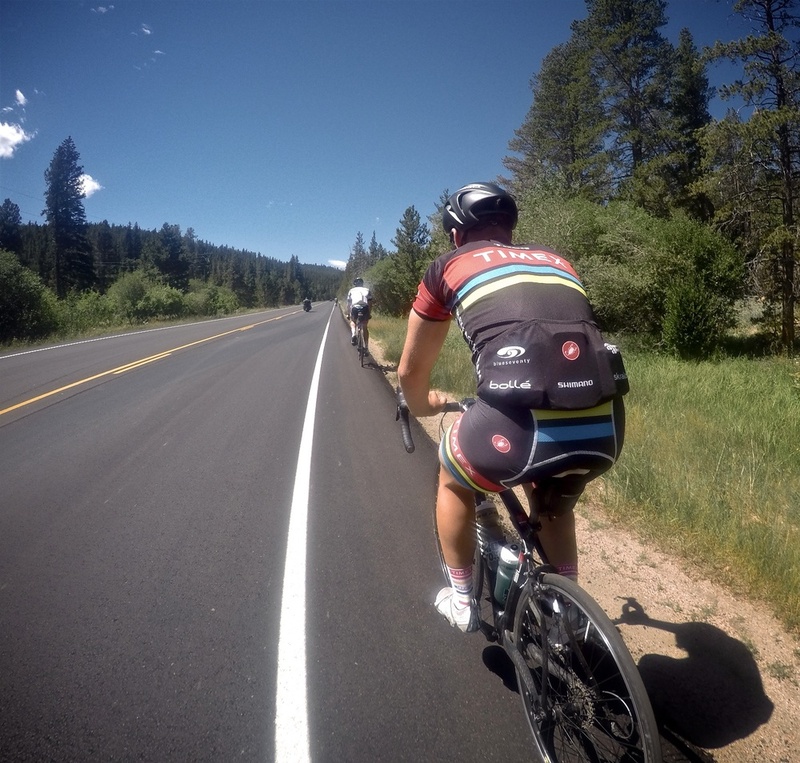 Look for a full recap from our Team Camp in Boulder, Colorado soon! Back in 2003, in the Lance era, Trek introduced their flagship race machine to the world, the Trek Madone. Named after the Col de la Madone, an infamous 12K climb in the French town of Menton, the Madone would soon become the most sought after bicycle on roads. Over the next decade, the Madone would win multiple grand tours (not including the Lance "victories") and continued to evolve and re-shape what it meant to be a super bike. Being a Wisconsin native, I have owned several Trek Madones in my day, including a Discovery Channel replica, circa 2006, and most recently a 2014 7 series. 2016 has marked the most unique changes to this historic race machine and I had to get my hands on one, for obvious reasons. Lucky for me, The Timex Team is fortunate to have a great partner in Trek, and that partnership afforded me the opportunity to get my hands on their new super bike - The Project one, Race Shop Limited H1 fit, OCLV 700 series carbon, Trek Madone. It's been a little chilly here in Boulder, CO, but it warmed up just enough to take the new ride out for her maiden voyage. 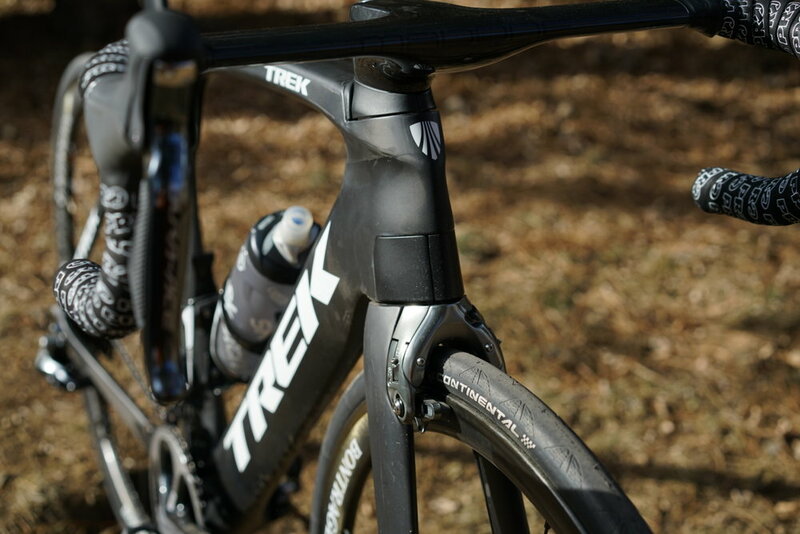 Here are some pictures and thoughts on Trek's new masterpiece. The Madone's front end is the most notably unique part of bike. A proprietary bar/stem combo, proprietary headset cap and spacers, a completely redesigned fork with a unique steer tube, recessed brake, and last but not least, those wings! The Vector Wings were a mystery to me - what did they do? After riding, even sprinting with the bike, it was clear that the wings don't really "engage" while riding. The wings are used to allow the front brake to be fully tucking into the frame for superior aerodynamics. When the bars are turned to a more extreme angle, the wings are engaged so the interior brake has somewhere to go - pushing the wings outwards. The integration and cleanliness of the front end is unmatched by anything else on the market. Literally the only visible cable housing, or cable for that matter, is the inch-worth of cable housing visible from the opening on the non-drive side headset cap - that's it! I'm a pretty flexible rider and after a professional bike fit it was clear I could get away with no additional spacers between the headset cap and the stem. 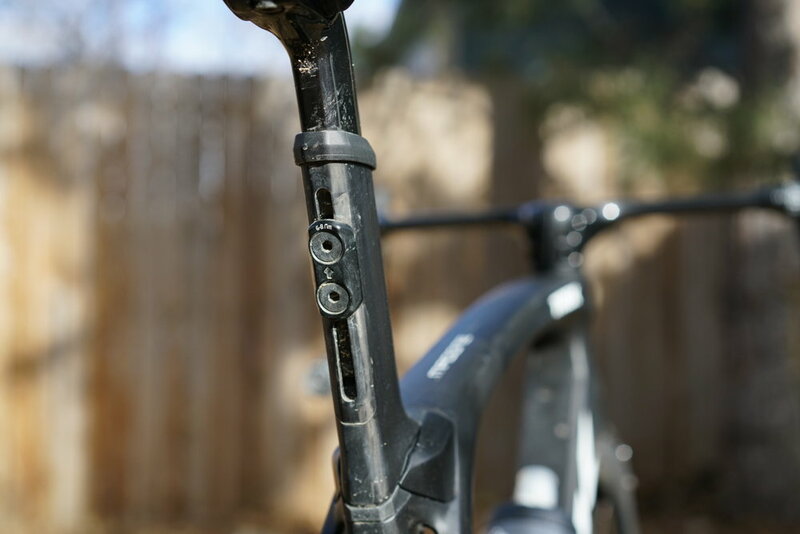 For those needing a bit more height in the front end, Trek provides you with plenty of spacers so you can dial in your perfect height. Also something to note is the built in 5mm spacer on the top of the bar/stem. As most know, it is industry standard to have at least a 5mm spacer on top of your stem when you have a carbon steer tube. With the Madone stem, that spacer is built in so the top cap can sit flush on top of the stem, rather than have an ugly spacer on top - makes your bike look so much cleaner. More integration is seen with the internal Control Center. I am running Di2 so this control center holds a 5-Port junction box where all the e-tube wires come together. The junction box is also the battery charging location and is easily accessible without a single tool. 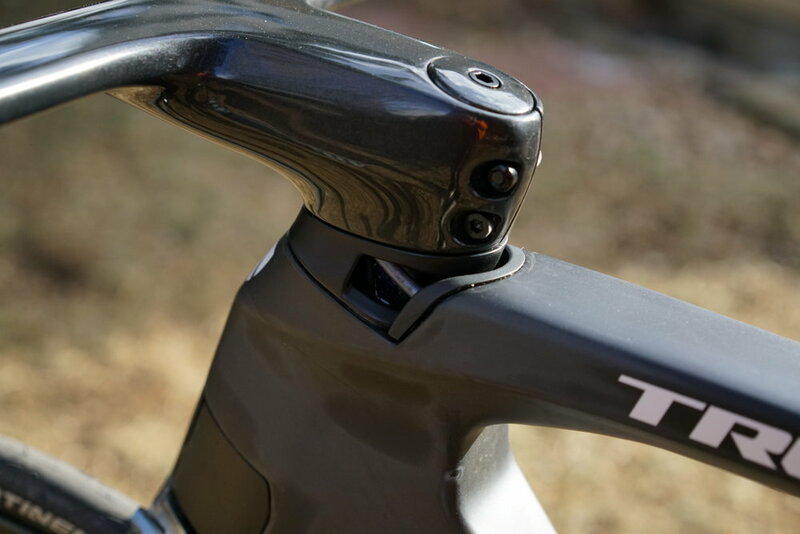 The Di2 micro trim button is also accessible for micro adjustments on the fly. 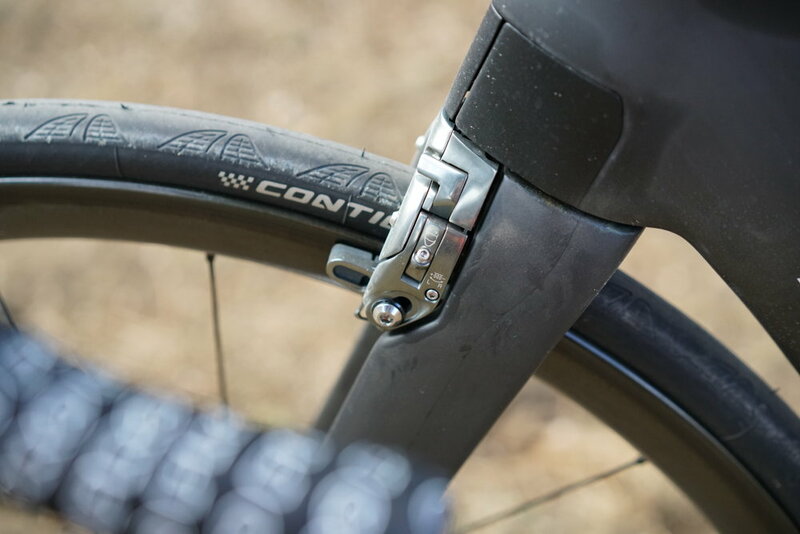 The integrated seat post has a unique dual tightening system. It seems to be aerodynamic and is very accessible when needing to adjust - no odd, tight angles to maneuver. The seat rail clamp is one of my favorite features of the bike. You torque the rails down to specification and then rotate the seat-mast topper to fine tune the adjustment. All in all, it is super easy to adjust your seat to the proper position, and once you have the position you want, it tightens down and doesn't budge. Stealing technology from the Domane and Boone range, the Madone also features the IsoSpeed decoupler. I can't say I feel any movement down there when riding, but I think that's the point. You know it's soaking up some of those bumps, but your power transfer isn't effected one bit. I can say the front end is a lot less forgiving than the rear end - must be the IsoSpeed. 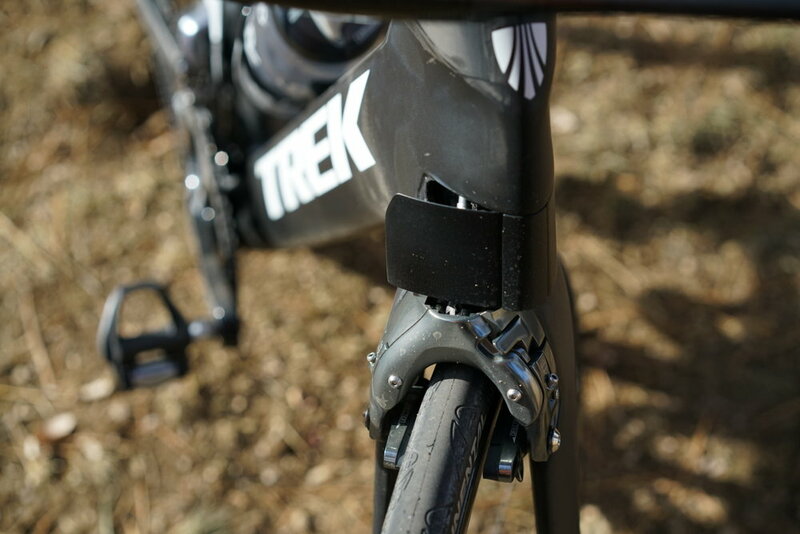 If you have a Trek Speed Concept, these Madone brakes will seem very familiar. They are both direct-mount and center-pull which equates to lots of braking power. They are also extremely easy to adjust with two micro adjustment screws on either side. 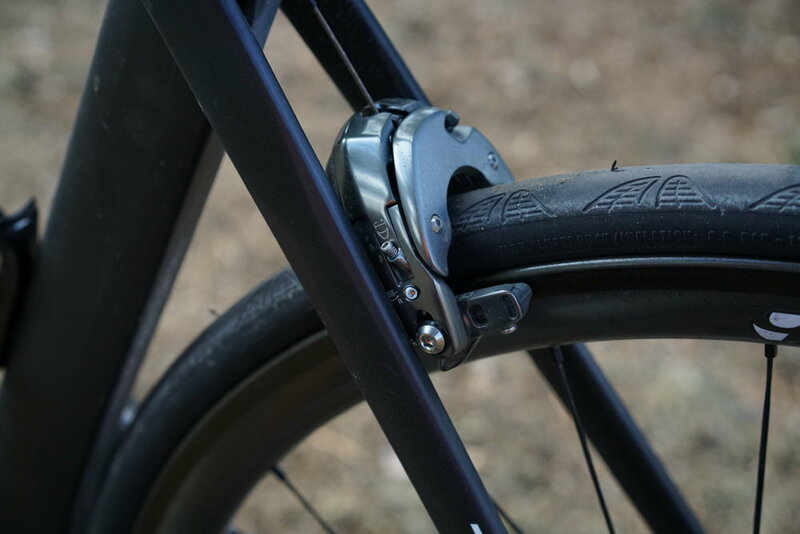 They don't seem to have the same power that a traditional Shimano Dura Ace direct-mount brake would have, and they are a bit heavier, but once you swing a leg over the bike it's clear the brakes work, and work well. Some of Trek's competitors can't say the same with their integrated aero brakes - I'll take the tad bit heavier brakes any day of the week. My new Madone only has about 70 miles on it so far, but I've got to say, it's easily the best bike I've ever ridden. Weighing in at just about 15.5lbs as show, it's light, fast and stiff. Coming from riding other aero bikes from a few different manufacturers, it's clear to me that Trek has taken everything one step further. This truly is a super bike. Dominating performances at 70.3 Xiamen - Jeanni Seymour Victory! Jeanni Seymour continued her winning ways with another dominating performance at the inaugural 70.3 Xiamen in China. leading from start to finish, Jeanni surprised no one with another near-10 minute margin of victory over Sarah Piampiano and fellow teammate Lisa Roberts (3rd in 4:36:12). This young but seasoned pro has definitely put herself on the map. In the men's race, Justin Metzler grabbed a much deserved podium spot with a 3rd place finish behind Josh Amberger and Tim Don. Timex athletes grabbed three of the six podium spots at 70.3 Xaimen! Out in Miami, Ellen Hart and Mike Wien took on Miami Man Tri and DU. Ellen, took the OVERALL female win and second overall including the men in the 1/2 Iron Duathlon in a time of 4:20:39! Mike Wien grabbed 1st in his age group at the USAT Long Course National Championship Tri. 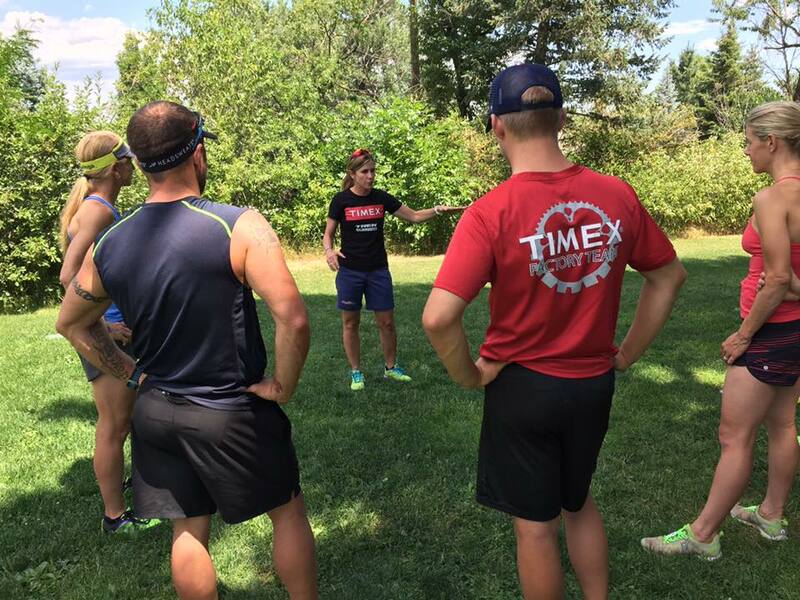 Timex Factory Team Application Open! The 2017 application for the Timex Factory Team is now open! Join a growing group of amazing athletes and ambassadors. Application deadline is December 31st so get yours filled out today. 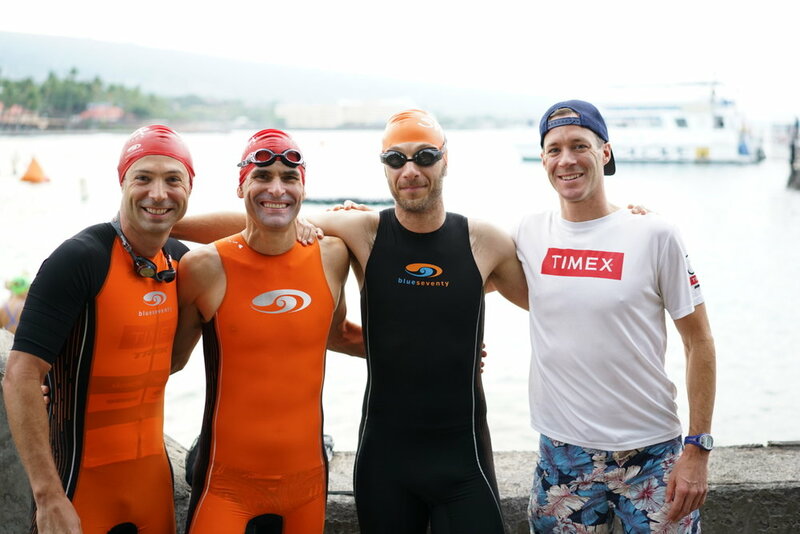 The Timex Team nearly had three overall Ironman wins in two weeks! With Sam Mazer and Jeanni Seymour taking wins at IM Los Cabos and 70.3 Austin, it was Tim Hola's turn at IM Florida. Tim Hola (CO) lead Ironman Florida, in Panama City Beach, from start to near finish. First out of the water in 53:29 and first off the bike with a 4:40:42 split, Tim lead all the way until mile 25 of the run until eventual winner, Jack McAfee, passed him. A tough loss for Tim, but an amazing performance! The silver lining was a 1st in his age group and a ticket to KONA 2017. Fresh off her Kona debut, Elyse Gallegos (FL) decided to give IM Florida a go to test her recovery and see what was possible. With a stellar performance, it's clear Elyse can handle the tough task of two Ironmans in one month. Finishing in 10:25 flat, Elyse grabbed first in the F25-29 age group and 7th female overall! Only a month after Kona, she's punched her ticket again. Elyse is Going, Going, Back, Back, to KONA, KONA! The third victory in Florida came in the form of Deanna Newman (AL) of the Timex Factory Team. With a finish time of 10:17:40, Deanna grabbed the F45-49 age group win and finished 6th overall! Shannon Coates (OR) also had a great return to Florida. The former FSU runner turned triathlete finished 6th in the F30-34 age group in a time of 10:46:59. Kona may be over, but the racing sure isn't! There were many great performances over the weekend including two overall wins! First up was Jeanni Seymore at Austin 70.3. Due to heavy fog in the morning, the swim was first delayed by two hours and eventually canceled, turning the event into a time trial start, bike-run. A strong bike leg positioning her within the top three and once on the run, no one could match her pace. Jeanni won with a 10 minute margin of victory! This marks her first win of the season and defends her 2015 Austin 70.3 title. Sam Long and Ellen Hart also took to the start line in Austin. Sam finished 7th behind some of the greats in the sport, while Ellen grabbed 1st in her age group. Sam Mazer is your 2016 Ironman Los Cabos female champion! With over 20 minutes to spare, Sam crossed the finish line first in a time of 10:58:27 to claim the title. Needless to say, this qualifies her for Kona next year. Also in Los Cabos for the weekend, Justin Metzler finished 9th in the 70.3 distance race. After three days of unique and fast racing in the Bahamas, Leon Griffin found himself in 6th place at the ultra competitive, Island House Triathlon. The event hosted 40 of some of the worlds best triathletes from multiple distance specialties. Times were cumulative from all the days events which included individual time trails, 5k runs, and finally a sprint triathlon to close out the finals. 2017 Timex Multisport Team Application - OPEN! So, you want to be a part of the longest running triathlon team in history? Here is your chance! The 2017 application is now open until October 31st. 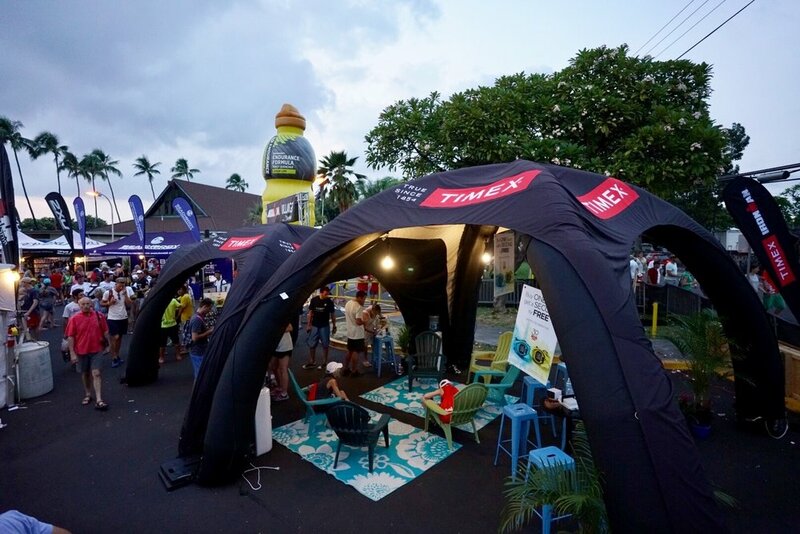 We had an impressive, 100% finish rate for the 18 Timex Multisport Team athletes who competed in Kona. Congratulations to all the finishers and a special shout out to Lisa Roberts on her top 20 Pro result, James Burke on 4th in the M35-39 age group (9th amateur overall), and Ellen Hart for 2nd in the F55-59 age group. The ITU Long Course World Championships were held in Oklahoma City on Saturday. The Long Course distance consists of a 4K swim, 120K bike, and 30K run. Team USA had an incredible showing with 12 age group world titles and of those athletes, two were from the Timex Team! Tim Hola captured the M40-44 title while Ellen Hart brought home the win in the F55-59 age group! Congratulations to our newly minted Long Course World Champions! InterBike, the biggest bike show in North America, converged on Las Vegas this week. The Team Sports crew flew out for meetings and to walk the show and here are a few things that caught our eye. Shimano's first Boa equipped shoe, the S-PHYRE (Available in Yellow, Blue, Black, and White). Probably the coolest product of the show - The new Stages Dash. Nearly unlimited display options and metrics, easy Stages calibration tools, split screen displays so you can toggle through screens while keeping a few metrics locked on another side of the screen, works with other power meters, and landscape mode are just a few of the many features. Skratch Labs' new Endurance Recovery Mix - Made with real ingredients like whole milk (No protein isolate stuff), and real flavoring from vanilla beans, chocolate, and coffee. YUM! This bike was just HOT. Alchemy is a small hand-made bike brand from Colorado and they recently entered the mountain bike world with this beauty. The frame and shock alone retail for well over $3,000. Cross Vegas is always a draw for people coming to Interbike. But this year it was an even larger event. For the first time, the USA's biggest cross race was given UCI World Cup status, meaning many of the worlds best came out to race under the lights of Vegas. Trek's new team, Telenet, had a large contingent of athletes racing. Cross Vegas is no doubt the most unique World Cup event on the circuit. The men's pro race started at 9pm and much of the course is on near perfect grass. Former Timex Team athlete, Cassie Maximenko, raced in the women's pro race and had a solid night despite being hit by a truck only a few weeks earlier. World Champion, Wout Van Aert, crashed early in the race and looked to be out of contention. After successfully bridging back to the lead group, he proved why he wears the world champ colors by leaving the rest of the field in the dust to take the win. That's a wrap from Vegas. The triathlon world was not that well represented at Interbike so we look forward to seeing much more new stuff in Kona! The ITU World Championships were held in Cozumel, Mexico this past weekend, where the best of the best at the Sprint and Olympic distance finally had a chance to battle for a World Tittle. In the Olympic distance race, Mike Wien and Ellen Hart shined! Mike took home top honors as the M65-69 Olympic Distance World Champion! Ellen Hart took second to Caroline Whittaker in the F55-59 age group. Scott Boylan, who suffered an accident on course, managed to finish 25th in the M60-64 age group. Trista Francis raced the sprint distance event on Saturday, finishing a tough day in 1:27:33. Back on US soil, Leon Griffin and Sam Long took on some of the worlds best Xterra athletes at the Xterra Pan-Am Championships in Ogden, UT. Coming off several months of racing struggles, Leon managed a stellar 3rd place finish behind 2015 World Champ and runner up Josiah Middaugh and Braden Currie. Sam finished the day in 7th place. Leon will not be going after the World title in Maui this yeah, however, Sam plans to make the trip. It's InterBike week! Stay tuned here for coverage on the stuff that matters in Las Vegas (well, the bike stuff). Last weekend, Mooloolaba, Australia hosted the 70.3 World Championships where Laurence Delisle (CA) took 2nd in the F25-29 age group and Ellen Hart (CO) grabbed 5th in the F55-59 age group. Kona bound athletes Meghan Fillnow (NC) and Derk De Korver (CA), used this weekends Ironman 70.3 Santa Cruz as a tune up for the Big Island. Finishing 4th and 8th in their respective age groups, they both punched their ticket to another world champs, the 2017 70.3 World Champs in Chattanooga, TN! Sam Long (CO) managed a 14th place in the stacked men's pro field. At the Tugaloo Olympic in Georgia, Wendy Mader took the overall female win while Mike Wien won his age group. 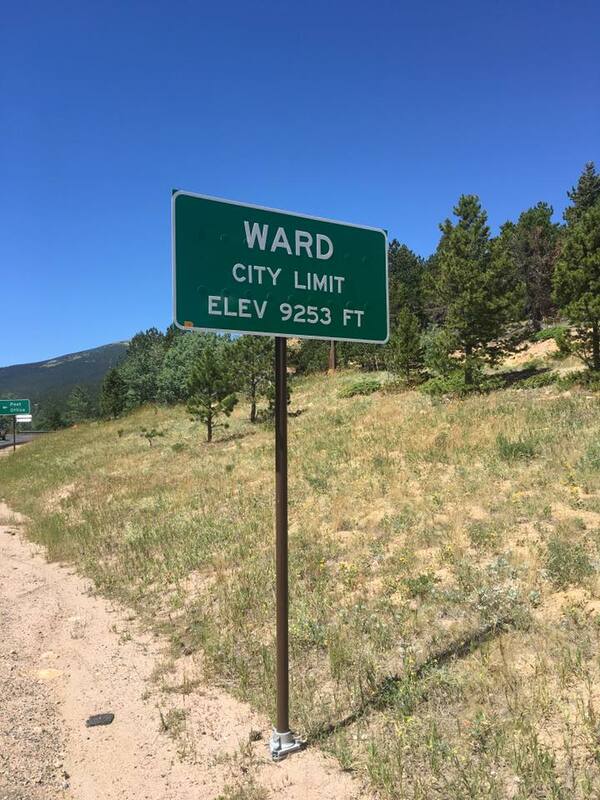 Wendy is a fresh transplant to Georgia from Colorado and is already making her mark on the local tri scene. Madison, WI hosted Ironman Wisconsin this weekend. In the women's pro field, Christine Hammond (CO) took 6th place in a time of 10:02:38. Dana Riederer (IL) placed 4th in the M35-39 age group, just missing out on a Kona slot for 2017. Dana running towards the Iconic Madison Capitol building. At Ironman 70.3 Weymouth in Dorset, UK, Justin Metzler (CO) placed 6th in the pro men's division. This marks the last European event for Justin, who spent the last five weeks there, traveling and racing. Tim Hola (CO) raced the inaugural 106 West Triathlon in Dillon, CO this weekend. Billed as the worlds triathlon, the course takes athletes to altitudes reaching above 10,200ft. Tim managed to take 2nd place overall with a time of 4:38 for the half distance event. "It was like sucking air through a straw" - Tim Hola on the 106 West Tri. Tim Hola - M40-44 Olympic National Champ! Tim Hola - 1st place overall! Add another name to the Kona roster! Mike Wien secured his slot to Kona with a nail biter of a race at Ironman Vineman last weekend. With roughly a mile to the finish, Mike made the pass for 1st place in the M65-69 age group. Only one slot was available for Mike's age group so it was win or no Kona. Amy D'Anna and Scott Boylan also raced Vineman, finishing 4th in their respective age groups. Luis Alvarez, feeling recovered from him Everest ascent, is back to his racing ways with an Ironman finish at Vineman. In Poland, at Ironman 70.3 Gdynia, Ann Parthemore took 2nd in the F35-39 age group and punched her ticket to the 2017 70.3 World Champs in Chattanooga, TN. Emily Kratz took on Noresman, one of, if not the hardest triathlons in the world, and finishing high enough to earn a Black Teeshirt (high honors). Tim Hola (CO) headed to Texas for the 70.3 Buffalo Springs event on June 26th. Tim finished in 4:13:28 - 1st in the M40-44 age group and 3rd overall! Wine country was host to the 70.3 Vineman event over the weekend, and was enjoyed by Christine Hammond, Lisa Roberts, and Laurence Delisle. Christine finished in the top 10 (4:30:53), Lisa came through in 4:40:55, and Laurence, recently released to compete after injury, pulled the plug on the run after a solid swim and bike split. On the East Coast, Chris Thomas (CT) took on the famous Pat Griskus Olympic, located nearly a mile away from Timex headquarters in Middlebury, CT. Still overcoming illness, Chris managed to take 2nd overall and says his fitness is coming back! Last weekend, Sam Mazer (WA) raced Ironman Victoria 70.3, taking 3rd in her age group!